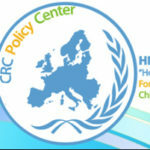 Thank you very much for supporting “Hope For Children” CRC Policy Center, and helping us promote our vision. In order to avoid improper usage of our logos we created this document which provides guidelines on appropriate use of the “Hope For Children” CRC Policy Center logo when associated with the purchase of reprint distribution rights. Please follow the detailed instructions that you will find in those guidelines. Logo files are available in several formats, and can be provided upon request. The final version of the material containing our logo should be sent to the competent officer of the Organization for approval. Remember, we are always available to help you or answer your questions.